SUNDAY October 14 saw the completion of the “Paint our Town” Art Project in Toora. 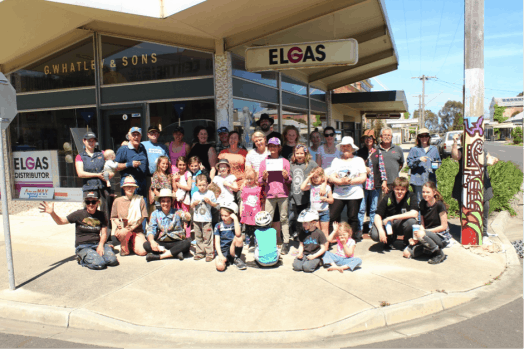 Under the expert direction of lead artist Leila Boakes and Liz Zanella, 60 energetic volunteers painted 19 power poles the length of Toora’s main street. Each pole has a different design inspired by both the street and the surrounding hills. Patterns such as tree fern fronds, rooftops, wind towers and front fences are repeated up and down the street. The freshly painted main street will next host Toora’s first T.A.S.T.E festival over the Cup Weekend, with several alfresco live music venues, amazing food and of course the new art trail!